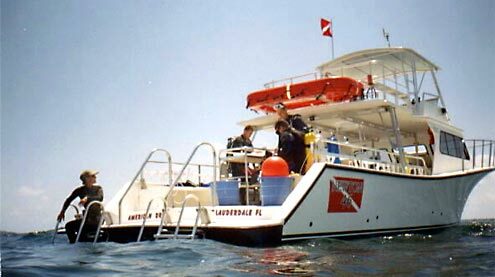 The American Dream II is a USCG certified 46' custom-built dive vessel. She is both roomy and comfortable, boasting over 400 Sq. Ft. of deck space, complete with upper level seating. Her 16' beam adds to her spaciousness and stability. Amenities include 3 freshwater showers including a Hot water shower, two large ladders on a full width dive platform with water level entry and camera table. All outings include complimentary snacks and beverages for passengers. The American Dream II is manned by a fun, friendly, professional crew, with diver safety and comfort paramount. The American Dream II is docked just minutes from Port Everglades and the best diving South Florida has to offer. 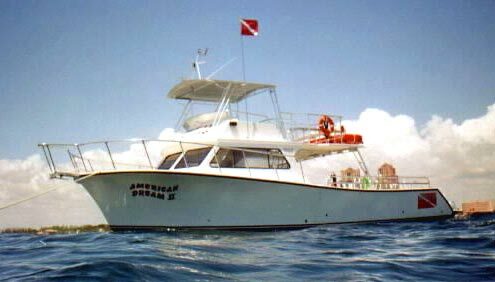 The American Dream II is perfect for drift diving, wreck diving, and lobstering. Custom charters and group discounts available.